How do NYC buildings stack up when it comes to energy and water efficiency? A new initiative from the Mayor’s Office of Sustainability and NYU’s Center for Urban Science and Progress is allowing New Yorkers to compare building energy and water usage throughout the city. The tool fulfills 2009’s Local Law 84, which requires owners of large buildings to annually measure their energy consumption through a process called benchmarking. So far, over 26,000 buildings are reporting with data from 2011 to 2014. The law requires private buildings over 50,000 square feet and public sector buildings over 10,000 square feet to report their energy and water usage, though many smaller buildings are still participating. This year, over 2.3 billion square feet have been reported. 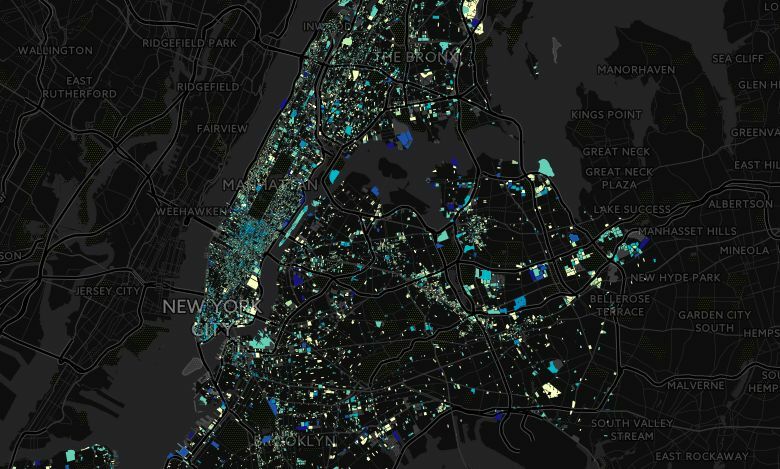 The map reveals that the highest energy usage in New York City is clustered in parts of Midtown, the Financial District, and the Upper East Side. The building types with the highest energy usage are hospitals, retail stores and dormitories/residence halls. “NYC has been a leader in data-driven approaches to urban sustainability, and this visualization platform provides a powerful tool for policy makers and the general public to better understand building energy use and carbon emissions,” said Dr. Constantine E. Kontokosta, PE, the Research Lead for the NYC Energy and Water Performance Map. This tool is representative of the city’s progress towards reaching OneNYC goals. The City plans to retrofit all public buildings by 2025 and move toward an 80 percent reduction in all greenhouse gas emissions by 2050.